Come along with Sheriff Woody and Jessie the Yodeling Cowgirl for some musical fun at Woody’s Roundup. It’s a hoedown you’ll find at Disney·Pixar Toy Story Land! Near the edge of the backyard, Andy’s set up one of his favorite playsets—a whimsical Western town and stable. But once his mom called him away, Woody and Jessie came to life… and wasted no time in letting all the toy ponies out to play. After hitching the ponies to carts, the duo began welcoming Guests to take a tune-filled spin and “do-si-so” around the corral. And now, it’s your turn! Just past an Old West wagon, you’ll journey down a desert pathway—passing a dried-out creek and crossing over bridges until you reach Woody’s Roundup. As you mosey inside, you’ll come upon kinds of Toy Story props and “Wanted” posters before reaching the pony pen. Your hoof-tappin’ hoedown begins as the ponies enjoy a square dance, swinging their carts—with you inside—to the sound of downhome, country-flavored melodies. It’s just the sort of swingin’, swirlin’ experience that would inspire anyone to get out and dance… especially the ponies! This spring, get ready to shrink down to the size of a toy in a high-spirited, colorful new world! Beginning April 26, 2018 at 1:00 PM, a day full of laughter and fun awaits in Disney·Pixar Toy Story Land, a larger-than-life new addition to Shanghai Disneyland. 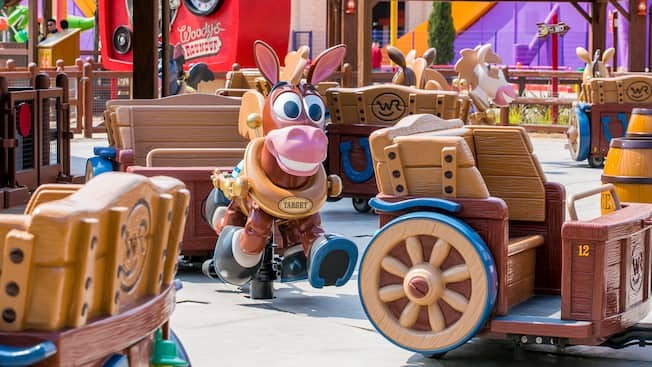 Set in the midst of Andy’s backyard, it’s a place where Sheriff Woody, Buzz Lightyear, Jessie the yodeling cowgirl and so many of your favorite Toy Story pals have come to life… and are ready to play! This is your chance to be surrounded by giant games, towering toys and fun surprises that Andy’s rigged up into a playground straight out of his vivid imagination—where kids and grown-ups can celebrate being forever young with new attractions, iconic characters, and Toy Story experiences of all shapes and sizes. It’s gonna to be the rootin’-est, tootin’-est time ever, one that “honorary toys” like you, your family and your friends are invited to discover when Disney·Pixar Toy Story Land opens this spring. Spin about with Slinky Dog as he chases his tail round-and-round a giant dog dish. Get ready for one amusing ride inside his springy spirals! Join dinosaurs Rex and Trixie for one of the land’s most exhilarating attractions as you zip back-and-forth aboard RC on a thrilling U-shaped track. In the Old West setting just outside Woody’s Roundup, you’re invited to a Character Greeting and photo experience starring Jessie and Woody! Enjoy picnic-style dining with freshly inspired meals served from toy boxes featuring Sheriff Woody, Mr. and Mrs. Potato Head, and Lots-o. Bring home a memory from your day of family fun in Disney·Pixar Toy Story Land—from games and toys to apparel, pins and other magical souvenirs.